A traditional classic British dessert. I’m not sure how well known this dish is outside of the UK, but for anyone who isn’t familiar, imagine French toast turned into a dessert, and you’re half way there. This is proper winter comfort eating. There are many variations of the recipe, but I really like this simple no-frills version. The recipe I’ve used here is pretty much this one from allrecipes, except I’ve used muscovado sugar and I’ve added vanilla which isn’t in the original – I have a bit of a thing for vanilla; as far as I’m concerned there aren’t many desserts or sweet baked goods that are not enhanced by the addition of vanilla. The original recipe says that it serves 7. We got through it in 4 servings – make of that what you will! 1. Preheat oven to 190C/370F. 2. Lightly grease a baking dish. 3. Butter the slices of bread and cut into quarters. 4. 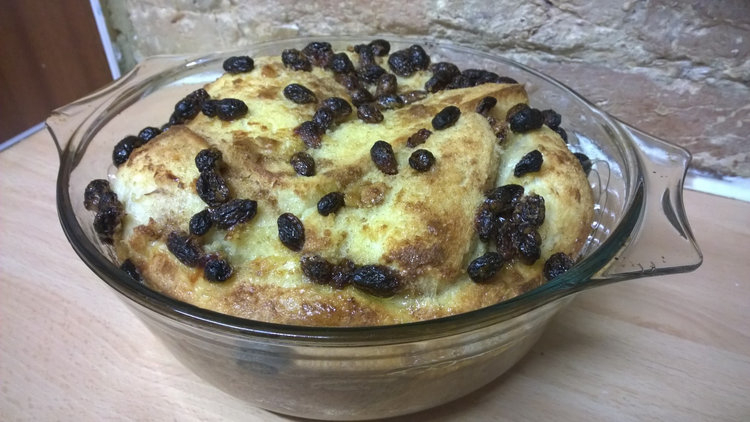 Mix together the sugar, cinnamon and sultanas. 5. Layer the bread in the dish in three layers, butter side upwards, adding the sugar/sultana mix on top of each of the three layers. 6. Whisk the milk, egg and vanilla together until well combined. 7. Pour carefully over the bread and leave to absorb for at least 10 minutes. Press the bread down a bit if it doesn’t seem to be properly in the liquid. I’ve made this recipe twice, and both times I left it for a couple of hours in the fridge before baking, just for the convenience of wanting to prepare it ahead of time. 8. Bake in the oven for at least 35 minutes until the top is lovely and golden brown and crispy. This is best served hot out of the oven (although you can cool and refrigerate it to eat cold, or reheat in microwave, but really it is far better eaten freshly made). I like it served with thick pouring cream. My Mom usede to make something like this when I was a child. Her parents were German so my guess is that the recipe came from the ‘old country’ which is how they referred to Germany. I thought bread pudding was a classic American dish! Most people my age and older grew up on it, since it was easy and it was a way to use up bread that was getting stale. You can put vanilla sauce on it, or chocolate syrup is good. I haven’t had any in ages – not high-tone enough for the modern age. I don’t like raisins in desserts, however, so I always picked mine out and ate them separately! Same with cinnamon rolls! It appears in a British cookbook from 1723, can you beat that? 😉 it’s probably a classic in many countries, as you say, it’s simple to make and a good way to use up stale bread back in the days when people were more frugal with food. I hadn’t had it for years either, but I asked Neil if he had any baking requests and he picked this! Comforting on a rainy day. That sounds yummy too! I keep meaning to try it with slightly stale croissants instead of bread, I’ve seen a few people talk about doing that which does sound good! Please madam, can I have some more? Ok ok, I’ll make more!